හිග්ස් බොසෝනය හෝ හිග්ස් අංශුව යනු, මුලින්ම 1964දී කල්පිතයක් වශයෙන් ඉදිරිපත් කෙරුණු, සහ ඒවායේ පැවැත්ම 2013 මාර්තු 14 දිනදී යාවකාලික ලෙසින් සහතික කෙරුණු මුලිකාංශුවකි. මෙම සොයාගැනුම "අනුස්මරණීය" ලෙසින් දැක්වෙන්නේ,  අංශු භෞතික විද්‍යාව තුල අනෙකුත් සිද්ධාන්තයන්ට සහ සම්මත ආකෘතියට විවර්තනීය වන, හිග්ස් ක්ෂේත්‍රය පවතින බවට සහතික කරන බවක් , එයින් පෙනී ගිය බැවිනි. ↑ වෙනත් ක්‍රියාවලීන් නිසාද මෙවැනි සිදුවීම් වන බවට සටහන් කරගන්න. විශේෂිත ශක්තීන්හිදී එවැනි සිදුවීම් වල සංඛ්‍යාන වශයෙන් වෙසෙසි අතිරික්තයක් තුලින් අනාවරණය සිදුකෙරෙයි. ↑ ඕවර්බයි, ඩෙනිස් (5 මාර්තු 2013). "චේසින් ද හිග්ස් බොසෝන්". නිව්යෝර්ක් ටයිම්ස්. http://www.nytimes.com/2013/03/05/science/chasing-the-higgs-boson-how-2-teams-of-rivals-at-CERN-searched-for-physics-most-elusive-particle.html. සම්ප්‍රවේශය කෙරුණු දිනය 5 මාර්තු 2013. ↑ ජියානා බ්‍රයිනර්, LiveScience (2013-03-14). "පාර්ටිකල් කන්ෆර්ම්ඩ් ඈස් අ හිග්ස් බොසෝන්". Science.nbcnews.com. සම්ප්‍රවේශය 2013-10-09. ↑ "නිව් රිසල්ට්ස් ඉන්ඩිකේට් දැට් නිව් පාර්ටිකල් ඊස් අ හිග්ස් බොසෝන් | CERN". Home.web.cern.ch. සම්ප්‍රවේශය 2013-10-09. ↑ Siegfried, Tom (2012-07-20). "Higgs hysteria: Despite the hype, many aspects of the boson's real value to science and society went unstated". Science News. http://www.sciencenews.org/view/generic/id/342408/title/Blog_Higgs_hysteria. සම්ප්‍රවේශය කෙරුණු දිනය 2012-12-09. "In terms usually reserved for athletic achievements, news reports described the finding as a monumental milestone in the history of science"
↑ Strassler, Matt (2012-10-12). "The Higgs FAQ 2.0". Prof Matt Strassler. සම්ප්‍රවේශය 8 January 2013. 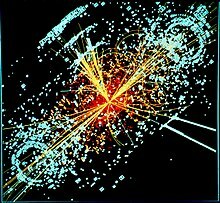 [Q] Why do particle physicists care so much about the Higgs particle? මේ පිටුව අන්තිමට සැකසුවේ 3 අගෝස්තු 2017 දින දී, 03:29 වේලාවෙහිදීය.